Strolling the lowlands or heading to the pub, you're shielded from the chill by the Scottish lion rampant. 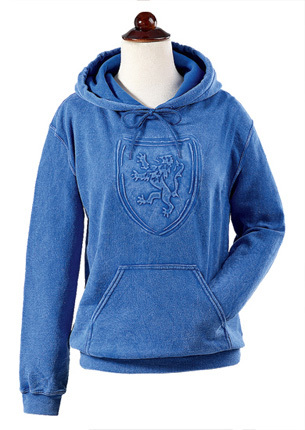 Embossed lion stands tall on a field of heathered saltire blue in this cozy hooded sweatshirt with fleecy interior. Cotton/polyester; machine wash. Embossed and stonewashed in USA. Sizes S-XL, 2X, 3X. Please note: this item has a price change based on size; please choose your desired size from the dropdown to see the price. The product that I received was exactly as pictured in the catalog. I received it quickly - even though just prior to Christmas - and with absolutely no problem. I will definitely order from Gaelsong again! Great sweatshirt. The fit is perfect. Now one of my favorites. .